At Shawn’s Professional Window Cleaning, It is our goal for everyone to have a better view of the world from their office, business or home. We strive to provide the highest quality service within anyone’s budget. We use professional products and equipment, as well as a thorough training program for all employees to make sure you get a high quality service at our great rates. If you need your windows cleaned for a special event, annually, bi-annually or serviced regularly, we look forward to doing business with you. We offer discounts for multiple services, such as gutter cleaning and window cleaning on the same day, and up to a 25% discount for regular service. Please call or email now for your quote over the phone or online! 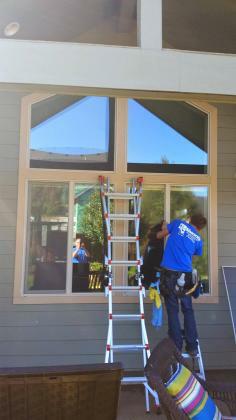 Our lead technician, Chad, working on a custom home in the Salem area.